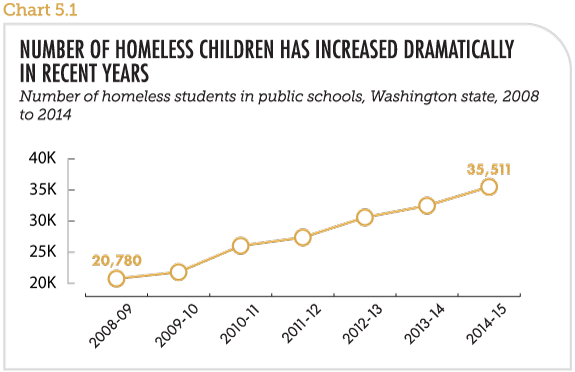 The number of children experiencing homelessness in Washington State has increased dramatically in the last five years, jumping to almost 40,000 youths in the most recent count. Sources: Ofﬁce of Superintendent of Public Instruction/Education of Homeless Children and Youth Data 2007-08 to 2014-15. The McKinney-Vento Act is a Federal law that requires schools to provide for eligible students regardless of their living situation. The act defines homeless students as those lacking a stable and adequate place to sleep at night, including when multiple families are “doubled-up” in a single family home. Mckinney-Vento also ensures that if students are unaccompanied they can still be enrolled without parental consent, or that they can remain in their school district even if their parents have to move because of unstable housing. 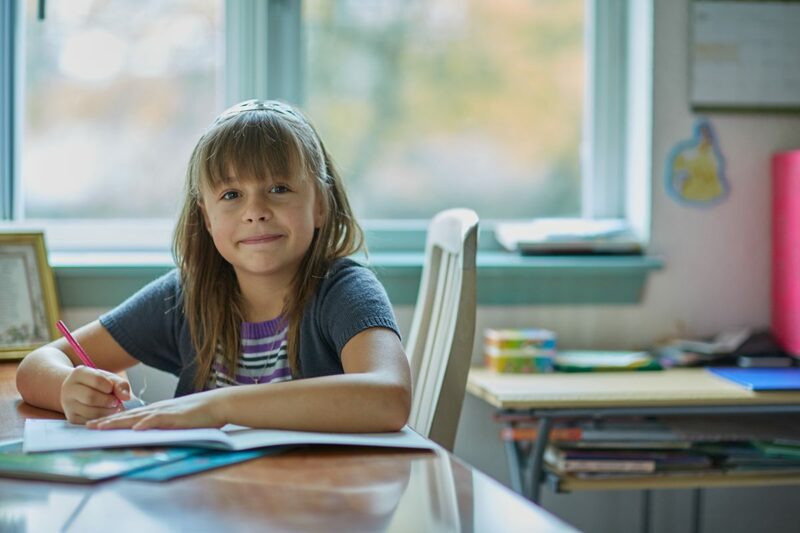 The Washington State Legislature created the Homeless Student Stability Act (HSSA) in 2016 to build on the requirements of McKinney-Vento, and to provide the funding necessary to help unstably housed students experience a regular school life. One of the most important provisions of Mckinney-Vento is that based on the best interest of the child, a student has the right to either remain at their school of origin or enroll in the school where they are currently residing. This is true even if the child’s homelessness spans multiple school years. If a student moves into permanent housing, they can also finish out their academic year at their original school if they wish. This consistency if important, as unaccompanied and unstably housed students are moved frequently, and when they are forced to switch schools, they lose four to six months of education each time. The Homeless Student Stability Program (HSSP) is operated in partnership between the Everett School District and YWCA of Snohomish as a part of the grant provided by the Office of Superintendent for Public Instruction for identifying homeless students and supporting them academically. YWCA Snohomish is able to provide immediate housing relief thanks to a second grant from the Washington State Department of Commerce. The partnership provides services to homeless and low-income families to ease the transition of homeless families into housing and to prevent low-income families from becoming homeless. Funds from the Commerce grant have been used to fill the gap that other housing agencies have not been able to provide, keeping families close to their children’s school districts, and cutting down on the cost of transportation that the school districts would otherwise have to bear. Heather Brink, Housing Services Manager at YWCA Snohomish called this the emerging “holistic” understanding of housing by the schools in HSSP. One family might have children in several different school districts, and with the improved communication and coordination led by the Housing Navigator, each child can be properly assisted. Everett SD’s Homeless Facilitator Amy Persusse says she now sees a “deeper window into what people are experiencing” in their efforts to keep their children in school while not having permanent housing. Before, parents calling the school district knew that they could not access services there, so would often “undersell” the severity of their situation. With the connections created by HSSP, Perusse is now receiving requests for help with housing from parents, who she is able to directly handoff to a service organization. The Homeless Student Stability Program also alleviates youth and family homelessness by preventing it in the first place. Perusse recounted calls she’s received from people who are in danger of losing their housing, and how she couldn’t help them until they actually lost their housing and become homeless. Now that Everett SD has received this grant she says that eight families, consisting of a total of over thirty people have been successfully prevented from losing their housing after they were connecting with YWCA Snohomish for help with rent assistance. The HSSP grant applications have opened for 2018 and will be awarded in July of 2017 if included in the 2017-2018 state operating funds. Everett SD is hopeful that they will be able to continue this partnership and is planning to reapply for grant funding. The Washington State Legislature should continue to expand this program from the pilot phase, and invest in similar efforts to bridge gaps in the current homeless services system. Filling in those gaps for our unstably housed students is a great first step.